Six candidates took advantage on Monday of the first available filing day to submit their nominating petitions to the Arizona Secretary of State's Office. 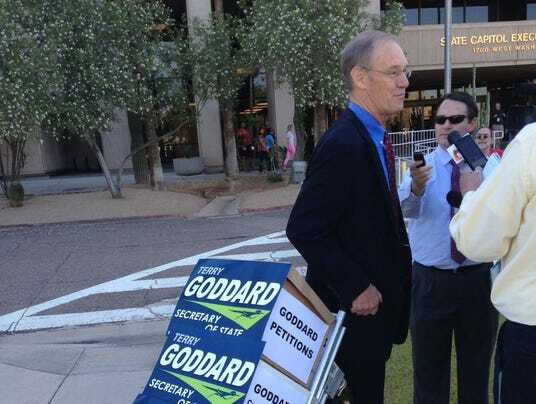 • Terry Goddard, a Democratic candidate for secretary of state and former Arizona attorney general, hauled in boxes of petitions on a handcart. Before heading up to the office that he hopes to run next year, Goddard told reporters he believes more voter education would help reduce the ballot pile-up that has delayed election returns in recent elections. He also said the state needs to crack down on "dark money" — campaign contributions that can't be traced to the original donors because the money is hidden through a chain of non-profits that don't have to disclose their donors. Goddard suggested it might take a ballot measure to outlaw the practice, saying there was only a "weak" effort this year in the Legislature to take on the issue.